The Crossbreed MiniTuck® Smith & Wesson® M&P® ShieldTM Holster features the same comfort and concealability of the larger SuperTuck® series but is ideal for smaller handguns or for those with a smaller body frame. Designed exclusively and patented by Crossbreed®, the MiniTuck® is hand molded to fit your Smith & Wesson® M&P® ShieldTM, has a "combat cut" and can be worn comfortably with or without your shirt tucked in depending on your personal carry style. SnapLok powder coated steel belt clips are modular to enable you to adjust both the cant and ride height of your handgun. "Combat Cut" on the holster adds to the ease of your draw. Crossbreed MiniTuck Smith Wesson M P Shield Holster is rated 5.0 out of 5 by 1. 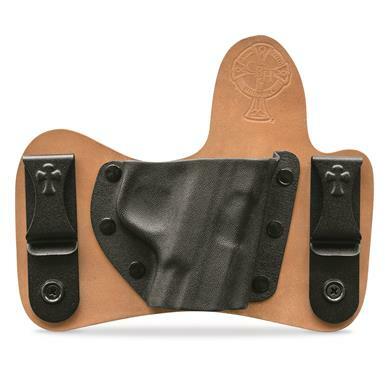 Rated 5 out of 5 by Ordie from The best CC holster I ever owned!! I bought this holster several years ago hoping that it wouldn't end up in the box of holsters. I was incredibly surprised at how comfortable and functional it was! I carry everywhere I go, every day and I have never been pinched poked or had my pistol come loose unexpectedly. I highly recommend this holster to everyone I meet that asks for recommendations. You will like it!